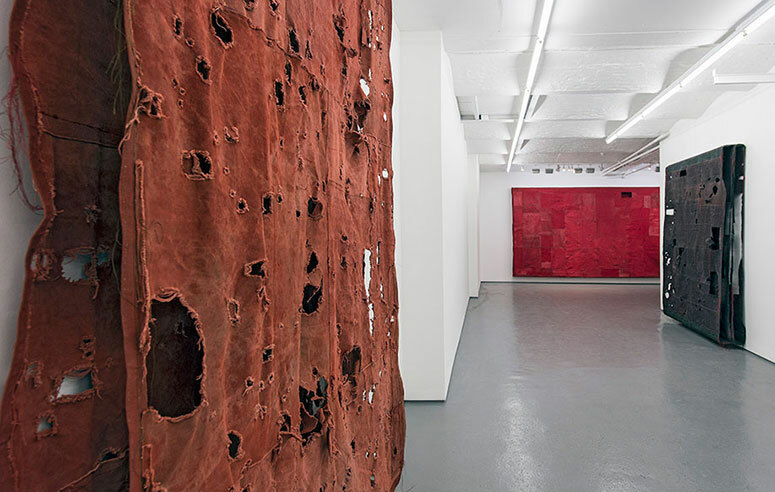 Simon Callery’s solo show Flat Paintings at FOLD Gallery serves as reminder that painting is far from dead. In this short video he describes his approach to a series of works that have been made in direct response to a landscape in North Wales as part of a project in collaboration with a team of archaeologists. The works at FOLD show an artist pushing at the boundaries of painting and offering multiple viewpoints for the viewer to engage with these large works as objects. Surfaces are worked to destruction, making them permeable in places, while the colour palette is dark, mineral or earthy, with a zing of cadmium red, which breaks down into hundreds of hue variations. The artist’s early training as a sculptor, before he made the switch to painting, has clearly influenced his thinking around the space that painting can inhabit and, while these are not landscape paintings in the traditional sense, they nevertheless reference landscape and place.